Arlington’s FLBR5420 series RECESSED FLOOR BOX KITS offer great new features, like two low voltage openings, an ultra-thin stamped steel flange, and flush-to-the-floor in-use and blank covers. 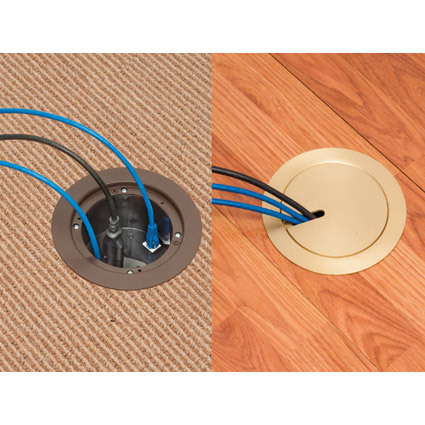 Here’s the solution for cost-savings and easy installation of a receptacle and low voltage connections in an existing, hard surface floor. Because the flange is ultra thin and the wiring device is recessed these floor boxes reduce the trip hazard caused by plugs protruding from the box. You can also have power and now TWO low voltage openings, without the need for a divider, in the same box. That’s convenience! Installation is quick and easy with a 5" hole saw. Four mounting wing screws attach the 24.5 cubic inch box securely to the floor. UL Listed 20A tamper-resistant decorator-style receptacle. Metal in brass-plated, nickel-plated and antique bronze-plated zinc. And powder-coated diecast zinc in black, brown and light almond. The low cost, convenient way to install a receptacle flush with a new floor.